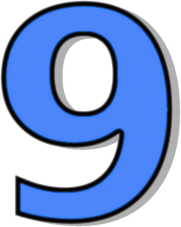 Number 9 is sometimes considered the ultimate number, with special or even sacred significance. When multiplied by any number, it reproduces itself (eg. 3×9 = 27, 2+9 = 9). Number 9 symbolizes the planet Mars, and its people are fighters- active and determined, they usually succeed after a struggle, but they are also prone to accident and injury, and may be quarrelsome. But at its best, number 9 will influence the highest qualities of courage and brotherly love. Number 9 will influence the highest qualities of courage and brotherly love. Number 9 people should try to carry out their plans on Tuesday, the day governed by their planet, Mars.